I've seen a lot of people making Swoon patterns, so I thought I would give them a shot. 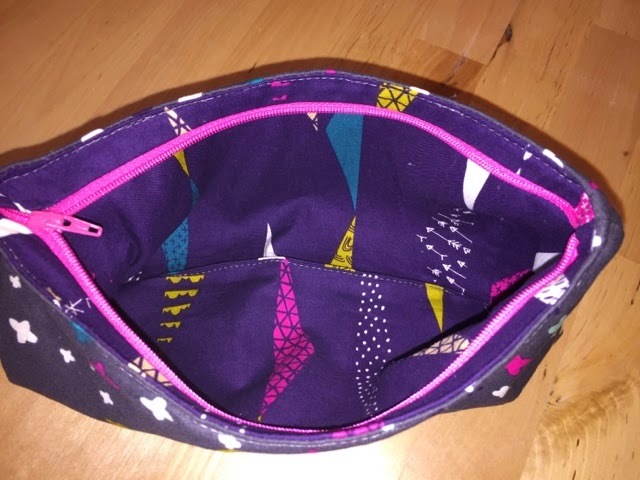 I saved the one that I really want to make, the Bonnie Bucket Bag, for another time and decided to start on a simple one to get a feel for the flow of Swoon's patterns with the Coraline Clutch. Coraline has 3 options. 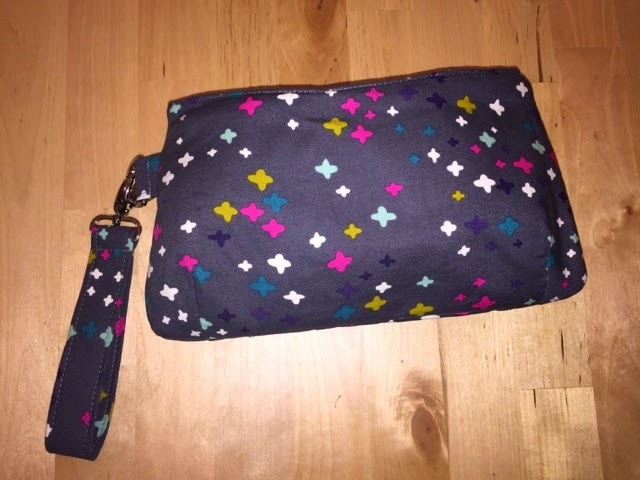 There are both large and small sizes that have a handle (the Coraline Clutch) or you can make the small size as a wristlet strap and no handle (the Coraline Wristlet). This third option was my pick because it is adorable, and I don't like the handles on the Clutch design. For the small size, the pattern requires 1/4 yd for main fabric, 1/4 yd for interior, and 1 yd of Pellon SF101. Since I had to cut a strap, I wound up having to use an additional 1/8 yd of my main fabric plus one 1" d-ring and swivel clip. Upon reading through the instructions, my first impression of the pattern was that it appeared to be pretty straightforward, so I cut my pattern pieces and fabric. When I was cutting my pattern pieces, I thought the way the darts were done was odd. I had never made darts how the pattern instructed. It worked in the end, but I don't think they had quite as clean of a finish as a normally constructed dart (like I've done in other bag patterns and clothing). I think their method for creating the darts would be easy for somebody that has never made darts and isn't likely to do so again outside of a Swoon pattern, but switching to the more conventional approach later may lead to confusion. With the darts done, I continued on through the remaining steps of the pattern. When I got to the edge stitching of the finished bag, I ran into issues. I had trimmed my seam allowance and any extra length on my zipper, but there was still so much bulk on the ends where the recessed zipper is that I feared I would break a needle (which is normally quite difficult for me to do on my Juki). I made it through the edge stitching part, and I am not pleased with how it looked. The bulk made my stitching look slightly wonky in some places, but it's finished. I wish I had opted to pad the bag with some fusible fleece (probably Pellon 987F because I think the heavier Pellon Thermolam TP971F would be overkill) because it feels very thin and flimsy to me. I can pretty confidently say that I am not a fan of this pattern, and I probably won't make it again. I am still planning to make the Bonnie Bag, so I'm not writing off all Swoon patterns. I do love how much stuff I can fit in it. I have my essentials which include an EpiPen, a small wallet, keys, my earbud pouch, and my iPhone 6 (not pictured because I used it to take the picture). I did also like that it was a very quick project. 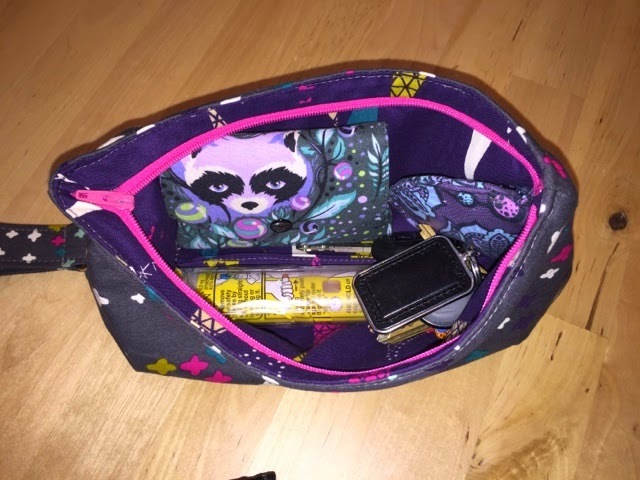 Of course half of my essentials are made out of Tula Pink fabric! I made something that wasn't a quilt or a bag!